Sign up to recieve Susan's Daily Natural Remedies newsletter along with over 100,000 subscribers! The easy-to-care-for nature of mint plants and their myriad of health benefits is well-known by now. However, there is another type of lesser-known mint that can bring your teas, desserts, and baking to the next level. Chocolate mint is loaded with many of the same benefits as more traditional varieties, but with a chocolatey taste that is sure to please. Plus, no green thumb is required to grow this hardy plant. Mint is famous for its ability to soothe the stomach and reduce irritable bowel syndrome. This could be due to the anti-spasmodic effects of methanol found in most mint varieties. Next time you have an upset tummy, whip up a cup of chocolate mint tea. Chocolate mint is loaded with vitamin A and can help fortify your immune system against germs and bacteria that may cause you to become sick. Plus, it can even help prevent other diseases like heart disease and diabetes by reducing the levels of free radicals found in the body. Chewing on mint or sipping on mint tea can help restore your focus and increase mental clarity. This can help you accomplish tasks and make it through that mid-afternoon slump without experiencing irritating mind fog. Chew on some mint leaves after you eat to help cleanse your palate, freshen your breath, and even help with digestion. Adding mint to your diet for cooling, seasoning and a boost of flavor can help reduce chronic inflammation and cellular damage caused by oxidative stress. 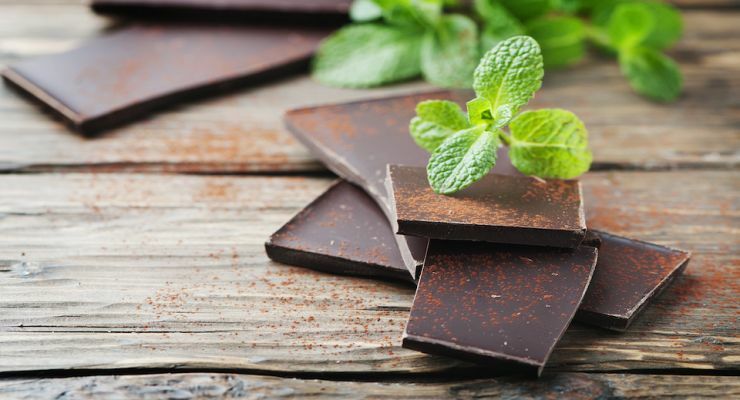 Chocolate mint contains phytonutrients that pack an antioxidant punch. When you are planting your chocolate mint, be sure that you place it in a bed that is solely designated for your mint. Otherwise, it will grow and spread and take over any garden area. It makes a beautiful ground cover and its fast-growing nature means that it is ideal to fill empty areas. However, if you wish to contain it, plant it in a raised bed or pot. Keep your plants watered and make sure that the soil stays fairly moist. Other than that, you don’t have to go through much fuss to keep your chocolate mint happy and flourishing. There is nothing like a beautiful plant to add flair and excitement to any home decor. Plus, having a potted chocolate mint plant indoors makes it easy to harvest for your next culinary creation while increasing oxygen in the room and acting as a natural air freshener. Chocolate mint truly is the gift that keeps on giving. Snip pieces of the stem and simply stick the cuttings in a pot of soil. These cuttings will develop roots and begin to grow. As easy as that! Put these baby mint plants in cute containers or recycled teacups for wonderful gifts. Chocolate mint tea is one of my personal favorite uses for this delicious herb. Fill a mug almost halfway with ripped up chocolate mint leaves and pour boiling water over them. Let steep for about 5 minutes (or more if you like your tea stronger) and strain leaves out. Add a splash of chocolate coconut or almond milk to make an even more scrumptious treat. This tea will help you get your chocolate fix while providing health benefits and clearing your mind. If you are baking pretty much anything that involves chocolate, your recipe will only be enhanced with the addition of chocolate mint. It gives muffins and cookies a refreshing mint flavor while deepening the rich chocolate taste. Chocolate mint can help reduce the number of pests that your garden experiences. Grow this plant in areas that are prone to attract flies, mice, ants, and mosquitos. Believe it or not, it is actually possible to make your own, totally homemade essential oil. And if you make it out of chocolate mint, you don’t have to worry about running out of the plant since it is such a fast grower. There are lots of methods for essential oil making, do some research and find out which one would work best for you. © Tropical Health. All rights reserved. Hey Buddy!, I found this information for you: "5 Health Benefits of Chocolate Mint and How to Grow Your Own". Here is the website link: https://www.tropicalhealth.com/health-benefits-chocolate-mint-grow/. Thank you.